Printreading and construction practices are presented in the sequence that occurs on an actual job site - from property layout and excavation through finish installation. 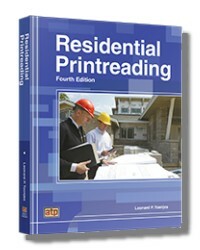 Comprehensive appendix and glossary provide an abundance of reference material related to residential construction. All types of drawings included in a set of residential prints are thoroughly discussed and illustrated to help the learner interpret prints and visualize a completed structure. Five sets of plans included in the Prints Folder provide authentic printreading experiences. The prints include drawings and related construction documents for a contemporary one-story house, a two-story tract house, a one-story ranch house, a large colonial house, and a contemporary multistory house. 359 pages 8-1/2 x 11in.